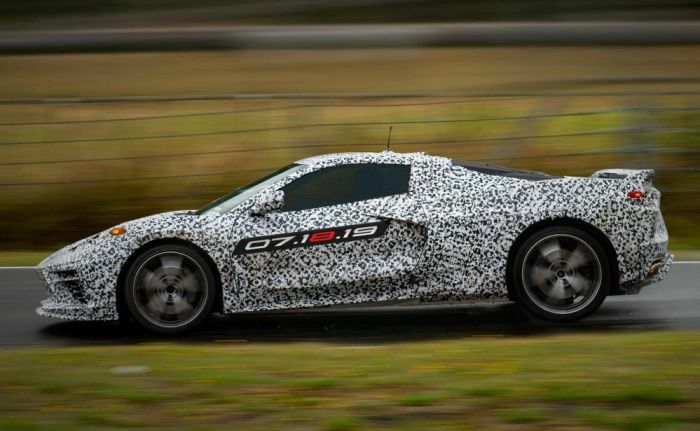 The next generation Chevrolet Corvette will have a mid-engine architecture and based on the date stamped on the side of the car driven by Juechter and Barra, we will meet the next generation of American automotive performance on July 18th, 2019. Furthermore, the official Chevrolet Facebook page shared a picture of the new Corvette on the track with a link to a minisite on Chevrolet.com which states that the next generation reveal is on July 18th. To be clear, the images shared here are not third-party pictures; these were images issued by General Motors. They are the real deal and they are the first official confirmation of the next gen Corvette program with an obvious shift to the mid-ship design. There are no other details, but for now, all that matters is that we know that the next step in the evolution of the Corvette is coming on July 18th. Whether you are a Chevy fan, a Ford fan or a Mopar fan, the transition to a mid-engine design by the Corvette should be of interest, as this is a major step in the American automotive industry. Should the Corvette with a mid-engine design prove to be a big hit and a big seller, we could see more American mid-engine performance cars going forward. Of course, the Ford GT has a mid-engine design, but that is a boutique car sold in such limited numbers that there is really no measure of true sales success. On the other hand, if the C8 Corvette with the mid-engine design sells in greater numbers than the C7 with the front-engine layout, we could see more attempts at American mid-ship performance cars in the future.